When their debut album, ‘St. Jude’, was released back in 2008, it won the Manchester based outfit a sizeable, dedicated following. The Courteeners second album, 'Falcon', sees the foursome, build upon their sound, creating songs more mature and ambitious than anything on St Jude; they’re impressive soaring indie anthems with Liam Fray's everyman lyrics at the forefront. Falcon showcases an emotional depth to Fray's songwriting, string-swept first track The Opener finds the frontman in good voice, professing his love for his hometown. The single You Overdid It Doll, already given extensive airplay, is an indication of what to expect, with its surprisingly effective disco-light beat plus the piano-backed Last of the Ladies and thundering finale Will It Be This Way Forever. There’s enough pop, and some surprising electro disco beats, to keep you guessing throughout the album which proves there’s more to The Courteeners than some might like to admit. PPL is changing its policy on how the go about distributing money to its members. At its discretion, PPL operated a policy of seeking to distribute monies to members relating to sound recording usage from as far back as 1996. This applied even where income relates to usage falling outside the six year statutory limitation period. However, from July 2010, as part of their ongoing systems development programme, they intend to change this policy so that PPL only distributes income relating to sound recording usage within the applicable statutory limitation period of six years. Until 26 April 2010, PPL will continue to accept claims under the existing discretionary policy for income relating to use of a track between 1996 and 2003. Any claims they receive after 26 April 2010, will only receive distributions for sound recording usage within the applicable six year statutory limitation period. The change of policy will allow PPL to release previously undistributable income to its members, which relates to sound recording usage between 1996 and 2003. PPL sees this as a positive change that will ensure that held income is distributed to its members within a reasonable period of time. Due to these changes it is important to ensure that PPL have your up-to-date details. Eminem, Muse and Kasabian will headline this year’s T in the Park festival. The appearance of Eminem is the biggest surprise; the event marks his first European show in five years and will be his debut appearance at the Scottish festival. More Acts are yet to be announced. T in the Park Tickets go on sale at 9am on Friday 26th February. 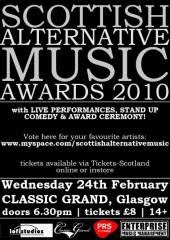 The Scottish Alternative Music Awards, a showcase of the best Scottish Alternative artists will take place at Classic Grand, Glasgow tomorrow night (Wed 24 February). The awards will be hosted by stand up comedian Billy Kirkwood & Radio DJ Jim Gellatly and there will be live performances from Make Sparks, This Familiar Smile, The Lafontaines and Bronto Skylift. The Parlotones came to the attention of music fans in Germany, Russia, France, Italy, Spain, Austria and the US, following an 18 month sold-out 300-date world tour, packing out 1000+ capacity venues in the UK by word of mouth alone. The internationally successful band is to mount a serious assault on the UK’s charts. With all eyes on South Africa as they prepare to host this year’s World Cup, the country’s most successful indie-rock band The Parlotones look set to cement their position on the global stage with exciting new single, Life Design, taken from their forthcoming album 'Stardust Galaxies’. The band has been supported by the likes of Razorlight and The Smashing Pumpkins at stadium shows in their home country and their band profile is such that they were also chosen to play at Live Earth, Africa Day. The subsequent performance was screened to millions all over the world. Their innovative, big-production music videos have been nominated for MTV awards and the band won two awards at the prestigious ISC (International Song Contest), in the US, judged by the likes of Robert Smith, Tom Waits and Rob Thomas. With a phenomenal buzz building around these guys and in a World Cup year when all eyes are on South Africa, The Parlotones will soon have the world at their feet. In an interview with BBC Newsbeat, Jay-Z spoke out about the music industry saying that record labels need to be "smarter" in order to survive. The rapper, who recently scooped the award for Best International Male at the Brits, explained that less is more when it comes to succeeding. The rap superstar set up his own Roc Nation music business, a joint venture with gig promoters Live Nation to manage artists, which looks after their tours as well as putting out CDs and downloads. So far there are only a handful of artists on his watch, including British acts the Ting Tings and Sugababes. "Records are not selling as many as they were before and you've still got to go out and pay the Bentley bill," he explained. "People have to be smarter about how they A&R and what they put out, record companies need to catch up to that, someone needs to send them the memo." He added: "I remember the first year I was at Def Jam we put out 56 artists. There's not 56 great artists in the world, and this is one company. One company operating for like, 80 artists in a year, that's just too many." Meanwhile, Jay-Z has announced two UK arena shows in Manchester and Birmingham in June, and will headline this year's Wireless festival. Last night’s Brit Award winner’s enjoyed a huge surge in album sales. Florence & The Machine and Dizzee Rascal saw sales of their music sky rocket following their success, as both artists won two of the biggest awards of the night. Music retailer Amazon.co.uk reported that sales of Florence and the Machine's record Lungs, named Best British Album, increased by 1550 per cent in the hours following the ceremony, sending it to the top of the Amazon music best-sellers chart. Figures for Best British Male winner Dizzee Rascal’s album 'Tongue N' Cheek' rose by 2400 per cent. Kasabian's album, 'West Ryder Pauper Lunatic Asylum' benefited from a 1625 per cent increase in sales after they were named Best British Group. Other acts that performed at the ceremony, including Lady GaGa and Robbie Williams, have also seen their record sales increase. Plus Florence Walsh and Dizzee Rascal’s Brits duet has become the UK’s fastest released single going on sale just five hours after it was performed. Walsh, from Florence And The Machine, sung a version of her cover of Candi Staton's You Got the Love mixed in with Dizzee Rascal's Dirteee Love. Their duet, You Got the Dirteee Love, was recorded live at 9pm last night and went on sale exclusively on iTunes at 2am, is currently at no.3 in the iTunes singles chart. All proceeds from the single will go towards the Brit Trust. DJ Fatboy Slim will headline the RockNess festival this summer, it has been announced. He will join headliners The Strokes and Leftfield at the three-day event, which takes place on 11-13 June at Dores, close to the banks of Loch Ness. The DJ, aka Norman Cook, played at the first RockNess festival five years ago. Belgian duo Stephen and David Dewale will also play as the official festival ‘house band’, both under their 2manydjs moniker and as live band Soulwax. Doves, Ian Brown and Friendly Fires have been confirmed, alongside Plan B, Dan le Sac Vs Scroobius Pip and The Cuban Brothers. BBC Radio 1 is the event’s official partner, with DJs Zane Lowe, Annie Mac and Rob da Bank hosting the festival. The event attracted more than 35,000 music fans last year. Headliners last year included the Prodigy, Dizzy Rascal, Biffy Clyro and Flaming Lips. A celebrity eBay auction has raised more than £120,000 in two weeks for the victims of the earthquake in Haiti. The auction was arranged by Glastonbury Festival organiser Emily Eavis for Oxfam's rebuilding programme in Haiti. Eavis thanked the musicians who donated items and the music lovers who bid on them. "Everyone's been so generous; it's fantastic to see how much people care. When we first had the idea of an auction for Haiti I never imagined we would raise so much," she commented. Lily Allen, Damon Albarn, Foals and Klaxons were among the musicians and artists who contributed lots to the auction. The top earner was a Damien Hirst print, selling for £12,655, closely followed by a Rolf Harris oil painting, which made £12,607. A jacket worn by Coldplay's Chris Martin on their Viva La Vida tour and signed by the band fetched £9,600. Other items up for auction included a song written especially for the highest bidder by Damon Albarn, VIP tickets to Glastonbury and the chance to have the Magic Numbers playing in your garden. Eavis previously visited Haiti in 2002 with Chris Martin and Oxfam, when it was already the poorest country in the western hemisphere. "It was a life changing trip as I'd never witnessed poverty on that scale before and it had a huge impact. It was a real shock and I suppose this obviously made things a lot worse," she said. Men at Work have been ordered to pay compensation after a court ruled they had plagiarised one of their biggest hits from a Girl Guides song. The track, 'Kookaburra Sits in the Old Gum Tree', was written by Marion Sinclair 70 years ago for a Girl Guides competition and was first performed in 1934. The current copyright owner Larrikin Music filed a copyright lawsuit in June 2009 against the group, claiming the flute riff from their 1980s hit 'Down Under' was stolen from the ‘Kookaburra’ song. A federal court in Sydney ruled today that the riff had been taken from Sinclair's song and Justice Peter Jacobsen ordered the band to pay compensation. Larrikin Music, who owns the rights to the song, told the Associated Press it may seek up to 60% of the royalties 'Down Under' has made since it was released. ‘Down Under’ was written by Colin Hay and Ron Strykert and went to number one all over the world. The song was also the first song by an Australian act to sit at number one simultaneously in the USA and UK charts. Both parties are due back in court on February 25 to discuss the compensation. One of Scotland's top music festivals is offering unsigned acts the opportunity to have their song used as the soundtrack for a TV advertising campaign. The Wickerman, now in its ninth year, wants unsigned acts to send in their music. Event organisers are currently working on a television advertising campaign and are looking for a piece of music which best captures the feel and spirit of the family friendly music event, to be used as the soundtrack. Organisers of the Wickerman festival, which takes place in Dumfries and Galloway, are also offering the winner the chance of being the opening act on the Summerisle main stage at this year’s event, which takes place on July 23 and 24. Festival Director Sid Ambrose is hoping for a good response, he said, "This is a brilliant opportunity for any unsigned act that can create an original piece of music. He added “Not only will their soundtrack be heard by an estimated 3 million people but they also win the chance to support some big name acts." Leeds singer-songwriter, Corinne Bailey Rae became a best seller when she released her self-titled debut album in 2006. The Sea, the follow-up to her million-selling debut, is a dramatic departure. 'He’s a real live-wire; he’s the best of his kind, wait till you see those eyes…’ These are the first lines she sings, in a husky, under-the-covers voice, on Are You Here, the opening song from her mesmerising and heartbreaking second album, The Sea. Corinne is describing her husband Jason Rae, who died of an accidental drug and alcohol overdose in 2008 while she was writing this album. Following a year out, she returns with an album that is deeper, rawer, and emotion-imbued, one that plumbs the depths of her sadness but also embraces a new seize-the-day positivity. Some songs pre-date his death, but, with a few unexpected, charming exceptions, all sound elegiac. Some of it is positively neck hair-raising, most notably the title track but also ‘The Blackest Lily’ and the haunting ‘Are You Here’. She seems lost in a daydream, wistfully recalling a quarrel on ‘I'd Do it All Again’, and distantly wondering how she'll look back on her own life on the slow-building ‘Love's On Its Way’. The Sea is no self-indulgent offering, even at its bleakest the music and melodies draw you in, even allowing for occasional swoops into blandish neo-soul, Rae has made an album she'll have trouble improving on.